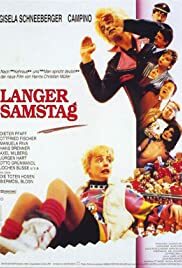 One of the best german movies since the 90s. So much about the plot, which isn't great at all. But the movie breathes the air of movies like "Zwei Nasen tanken Super" and has the heart to be german, including accents and all that stuff. It also features that kind of stupid slapstick you laugh about, even you are ashamed. And when the police, played die DIE TOTEN HOSEN, arrive at the supermarket, they just blew the screen. So, not a good movie at all, but a must see instead.